You must think I’m a smoothie fanatic. Or something like that. 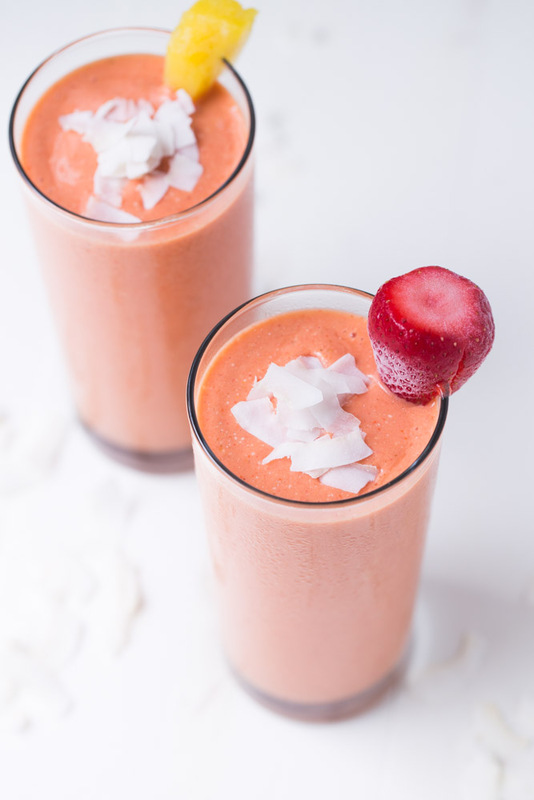 I shared this Berry Cherry Pineapple Smoothie two days ago and now I’m sharing this Tropical Strawberry Smoothie. I’ll probably share another smoothie recipe next week. Or maybe not. You’ll have to wait to see what the recipe gods have in store for next week. I will too. Because, randomness. I’m mostly a random person. I like change. I hate rules. I hate routine. I like change and I embrace it like it’s going out of style. One of the only things I’m not random about is how I make my smoothies. 99% of them are vegan. All of them contain either almond milk or coconut milk and 90% of them contain pineapple. There isn’t much randomness in those features. But if you look at all of the other ingredients I use, you’ll find randomness. Sometimes I use blueberries and cherries. 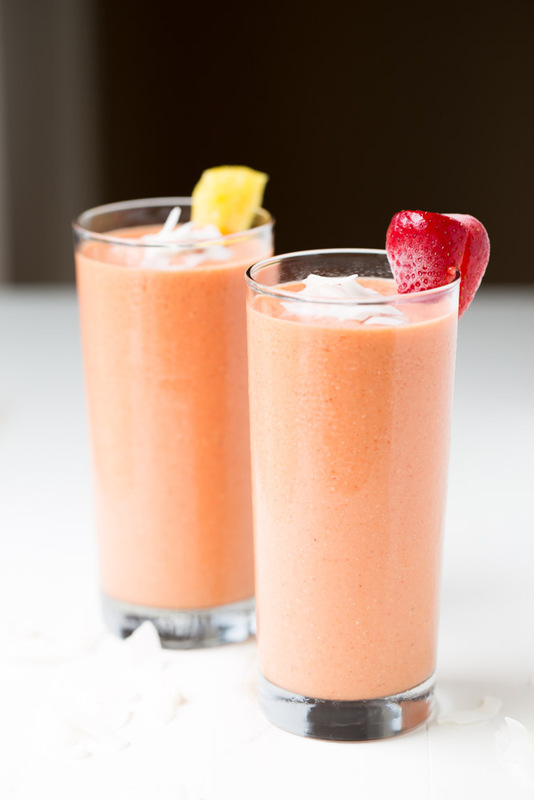 Sometimes I use strawberries and orange juice, as is the case with this tropical strawberry smoothie. Sometimes I don’t use any berries and opt for chocolate and peanut butter instead, as is the case with this Chocolate Peanut Butter Smoothie. What do I like about this Tropical Strawberry Smoothie? It tastes like strawberries with pineapple. It tastes like strawberries with pineapple and orange. It’s made with superfoods (hemp seeds + gogi berries). It’s made with coconut milk and coconut flakes. Coconut FTW. It tastes good. Tasting good is important. It makes a lot of smoothie, approximately 36oz, to be exact. Place all ingredients in a blender. Blend until smooth. If using a blendtech blender, blend using the smoothie setting for one interval. I can’t lie. When I saw another smoothie recipe I was like WHAT THE WHAT? BUT THEN, I saw the ingredients. And it all made sense to my taste buds, because these sound delish! I bow down to the smoothie queen! Pinned! You are too silly, Taylor! Thank you so much for the comment and the pin. Hope you had a great weekend! NEVER enough smoothies–this one looks fab! I love smoothies! Ahhh, and these colors are gorgeous, Julie! Smoothie looks absolutely stunning and yummy! Loved the addition of coconut milk. Happy Friday! Thank you, Anu! Hope you had a great weekend! 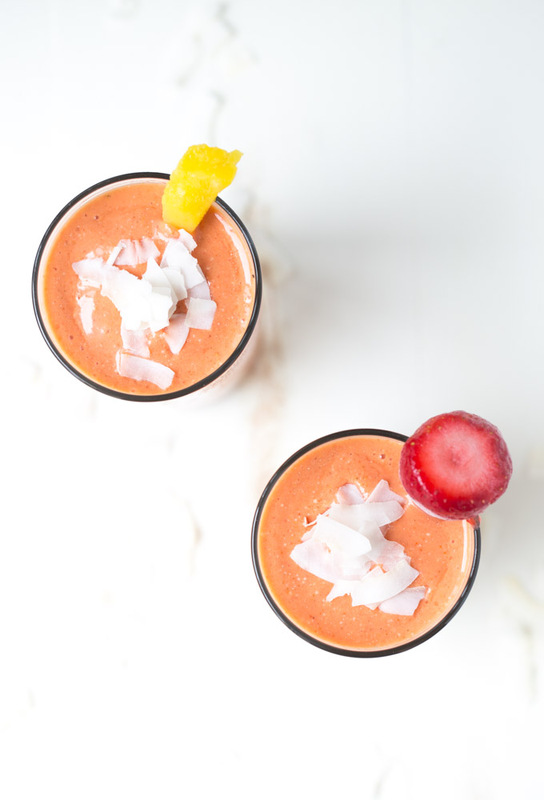 Love all the tropical flavors in this smoothie! I don’t usually add pineapple to my smoothies that often, but it’s such a great idea! Using pineapple in smoothies is great! It adds enough sweetness that no additional sweetener is needed (at least for me, anyways!) Thank you so much for stopping by, Lisa! This smoothie sounds heavenly! I just love the bright colour and the tropical flavour! Perfect way to start your day! Another smoothie that has my heart! I could easier drink a smoothie everyday and with all the variations no day would be the same! This one looks fabulous too! I can’t wait to get back to smoothie making with these recipes. Thanks for sharing! Strawberries. yum Thank you for joining the Small victories Sunday lInkup party. Please join again. Pinned to the group baord. I need to get back into the smoothie habit. This one looks gorgeous. Yummy! PInned & Shared. Thanks for joining the Inspiration Spotlight Party. Hope to see you again soon.